Altbier is complex, hoppy and pleasantly bitter. 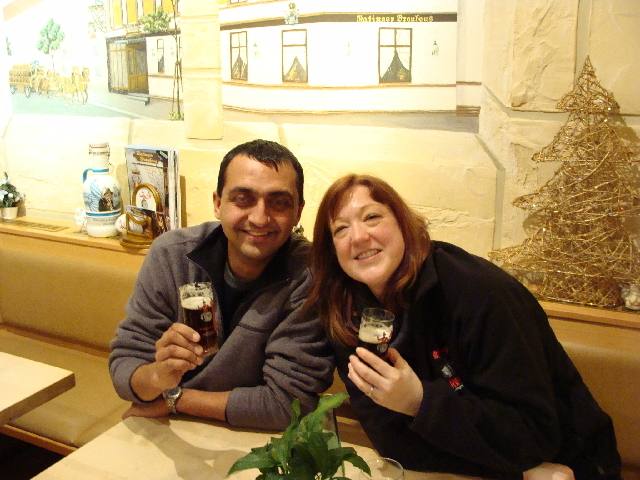 Many thanks go to fellow Altbier tasters: Kerri "The Beer Wench," Sachin Patel & Dean Graves. Allied bombs ravaged the industrial city of Düsseldorf in the North Rhine-Westphalia region of Germany during World War II, and only a few medieval structures remain in the old part of town (Altstadt). Düsseldorf hardly ranks on any list of top tourist destinations in Germany, but locals and hard-core beer aficionados from around the world hold the city in high esteem because of its delicious and unique style of ancient brew. This article first appeared in Beer Advocate magazine. 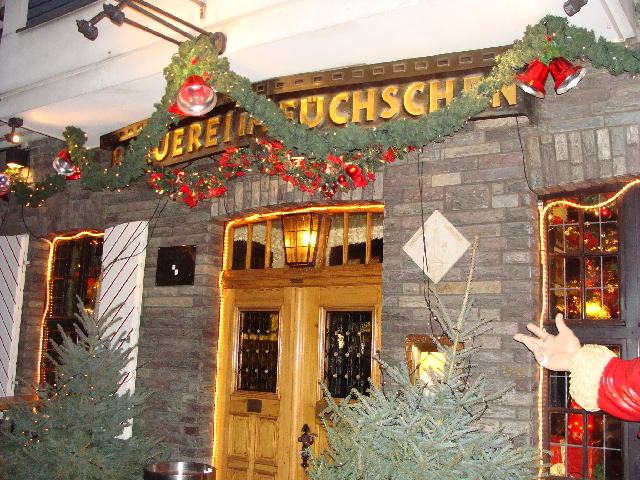 A waiter at Düsseldorf 's Füchschen brewery tap informs customers in broken English, "Our wonderful Altbier - good for liver, kidneys - you feel good in morning." A separate group of patrons smiles and nods in agreement. Altbier commands an almost maniacal devotion among citizens of Düsseldorf. While lagers and German Pilsners reign supreme in most areas of the country, Altbier accounts for almost half the beer consumed in Düsseldorf, and local Altbier breweries and quaint brewpubs churn out surprising volumes of the antique beer style. Usually served by gravity taps from wooden casks, Düsseldorfer Alt is consumed from small 0.2 or 0.3 liter cylindrical glasses. "Alt" translates as "old," and modern Altbiers represent living examples of an age-old style of top fermenting ale popular in Germany before Bavarian lagers became the rage in the 16th and 17th centuries. 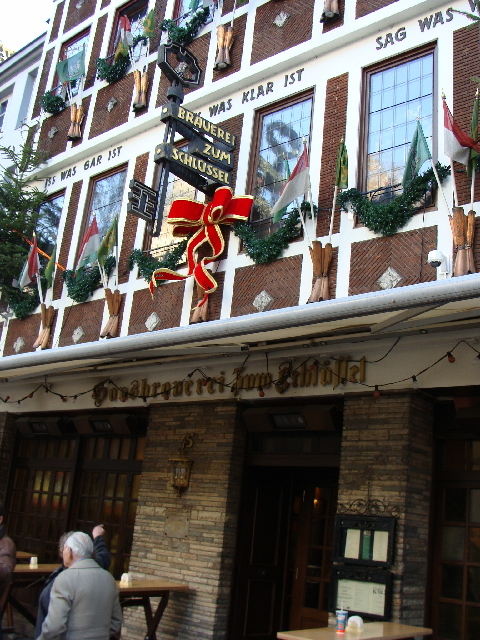 Düsseldorf's moderate climate provides an ideal environment for brewing the special ale. 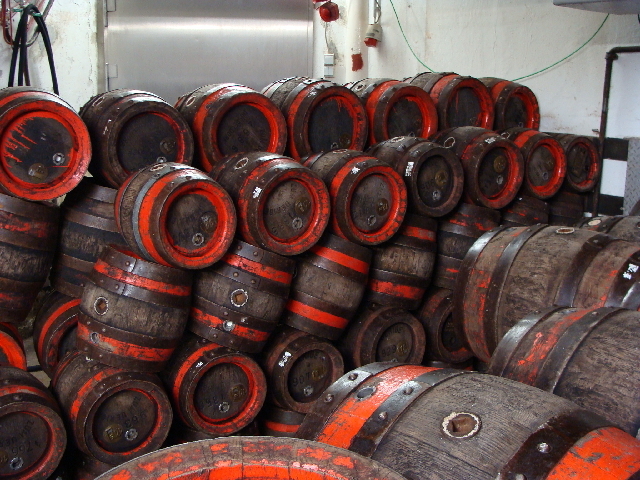 Production usually involves a primary fermentation at 55-65° F, followed by a cold lagering period that somewhat reduces the fruity esters associated with most ale styles. A classic Düsseldorf Altbier should exhibit clean, yet subtly complex, German malt and noble hop aromas. No cooked corn (dimethyl sulfide) or butterscotch (diacetyl) should be detected. Amber to very light brown color range is typical, along with brilliant clarity and an enduring head. 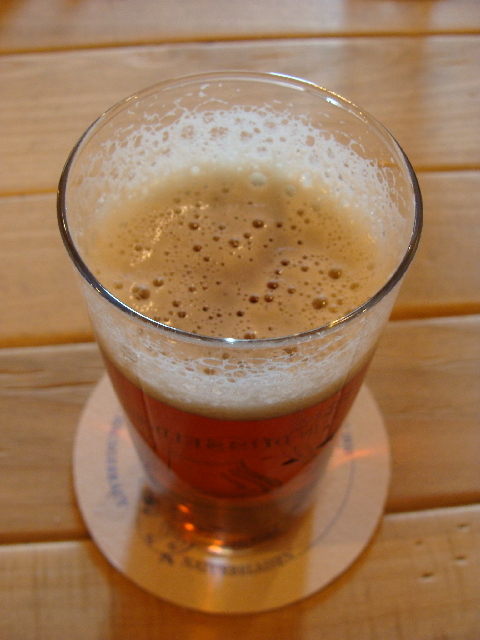 In regard to flavor, a crisp, moderate, German malt character should balance substantial hop bitterness (25-50 IBUs) and light to moderate noble hop flavor. Slight fruity esters from the ale yeast may persist in some examples, along with light/medium body and moderate carbonation. Original gravities of 1.046 to 1.054 are typical, and final alcohol percentages fall within 4.3 to 5.5 ABV. German malt varieties such as pilsner, Munich, crystal, wheat and a small quantity of dark varieties such as chocolate or black malt may make up Altbier grain bills. Pilsner malt provides highly attenuative sugars and a light/medium mouthfeel in the final beer, while Munich malt often contributes a pleasant, toasty character. Noble hop varieties such as Hallertau, Tettnang and Spalt hops render aroma, flavor and bitterness reminiscent of flowers, pepper, wood tannins and/or light perfume. Andreas Schumacher, head brewer of the delightful Uerige brewpub, says, "It's important to try fresh Altbier in Düsseldorf. There is a big difference in the beer here in our brewpubs and the bottles sent to America. Altbier is so special because it follows the very old traditions of the region - our beer is made by hand in the very traditional way." Unfortunately, very few U.S. beer lovers or brewers venture to Düsseldorf to experience the Altbiers, and the bottled exports tend to suffer from the trip and die from oxidation on American shelves. In Düsseldorf, the extremely fresh, sessionable Altbiers exhibit elegant complexity, lingering hop/malt flavors, and a surprising measure of variability from brewery to brewery. - An extremely popular, multi-room pub with labyrinth-like brewery located in the back. 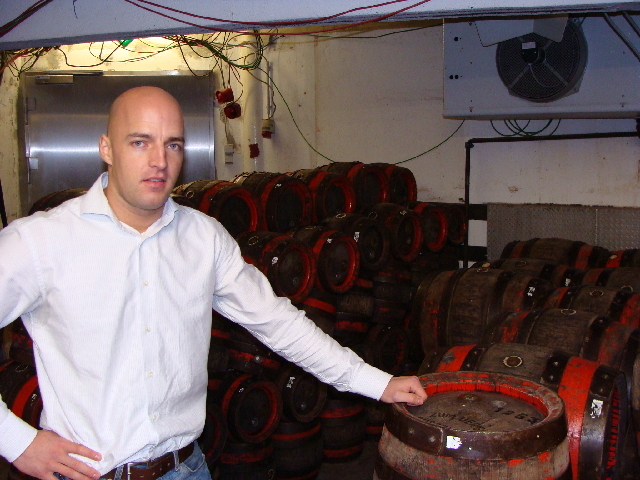 Altbier is served from beautiful old wooden barrels that are hoisted onto the bar by 2-3 waiters. - Altbier: Mild aromas of woody, slightly floral hops in the nose; malt aroma is low; esters are moderate. 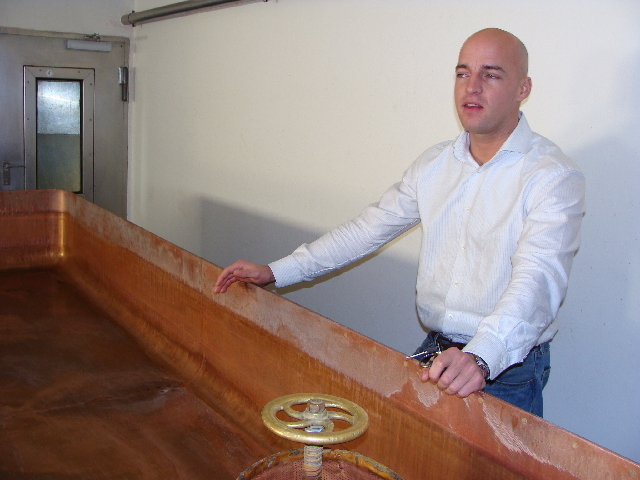 Color is deep copper with a light layer of ivory foam from light/medium carbonation. Overall impression is a hoppy, dry Altbier with light/medium body, low sweetness and impressive tannin-like bitterness. Flavor profile includes mild caramel, moderate toast notes and subtle, fruity esters. A delectable, toasty, woody flavor lingers on the palate to help create one of the most memorable Düsseldorf Alts. - This brewpub, located in the heart of the Altstadt, showcases its Altbier tap in the front and dining rooms toward the back. Due to severe damage during World War II, the exterior and interior of the pub saw refurbishment in recent years, with much of the original Old World charm being preserved. - Altbier: German malts dominate the aroma and produce a grainy, toasty note. The aroma hops are floral, and esters almost unnoticeable. This dark copper Alt produces a long-lasting, creamy, substantial ivory head and lots of lace on the glass. Mild flavors of bread, light caramel and toasted malt meld with slight floral, woody hops and very subtle esters to produce a beer not nearly as dry and bitter as Uerige's. A hint of toasted nuts highlights the finish. - Quaint, homey pub on the north end of the old town. The colossal food menu includes rustic, hearty German cuisine. - Altbier: Light citrus and grape esters peek through in aroma and flavor. The appearance includes a copper color and resilient, medium, off-white head. A medium-bodied, creamy, complex Altbier with fruity notes, toasted grain character, and a spicy, mineraly, peppery note and medium hop bitterness in the finish. 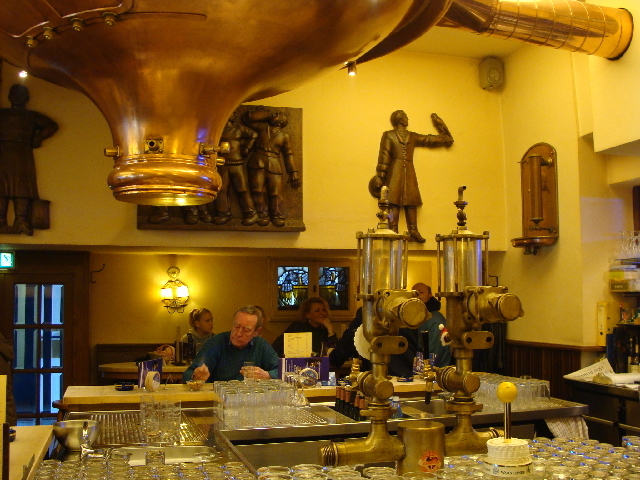 - Düsseldorf's only traditional Altbier brewery that's located just outside the Altstadt. Despite the fact that this is also the city's oldest brewery, portions of the interior appear fresh and refurbished. - Altbier: Floral hops, mild fruity esters and a subtle sulfur note mingle with light grainy, toasty malts in the aroma. A thin ivory head sits atop the clear, copper-hued ale, and bready, toasty flavors control the malt flavor profile. Hops are floral/woody in flavor and produce mild bitterness. Hints of agreeable esters and mineral-like notes come through in the light-bodied, dry, slightly watery finish. - The brewery, once located in a complex behind the pub, relocated to a large, modern facility outside of town to keep up with German and export demand. 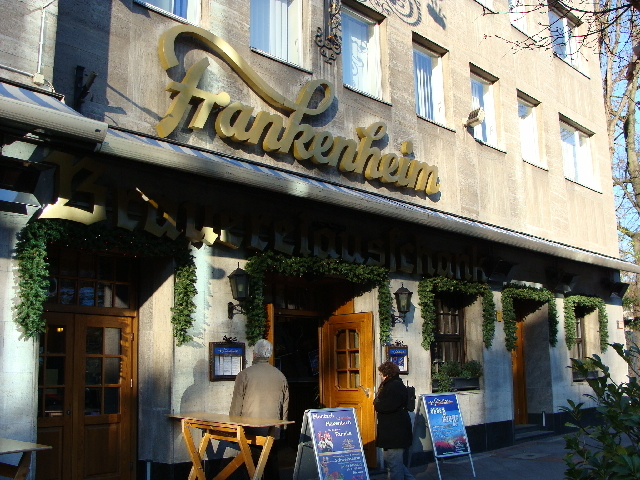 Located several blocks northeast of the Altstadt, Frankenheim's taphouse offers several dining rooms and a bar area filled with artifacts from the old brewery. - Altbier: Light fruit, dark malt, toast and light hoppiness comprise the aroma profile. Brown in color, this is a very dark example of the style (21-22 SRM). Flavor balance is definitely toward toasty, nutty, slightly roasty malts; and hops show an herbal quality. Bitterness is moderate and countered by a pleasant, fruity note. Medium-bodied with light carbonation and mild creaminess. 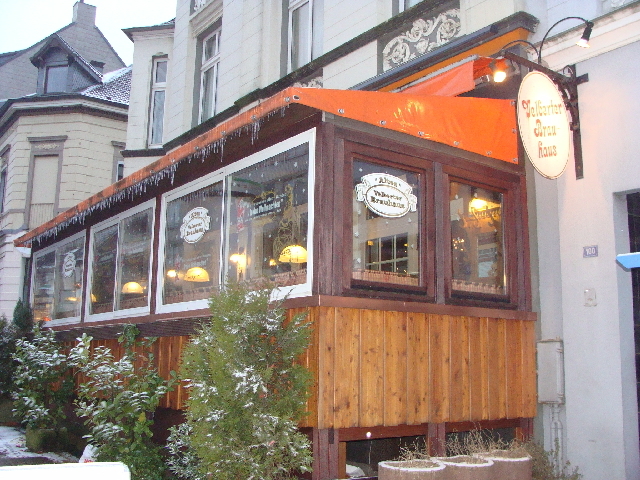 - A smoky, single room pub that showcases the mass marketed Diebels Altbier from InBev. Available on draft and in bottles in several countries (including the U.S.), Diebels is the world's largest producer of Altbier. - Altbier: Very slight aromas include floral hops and a hint of dried stone fruits. A large, creamy, ivory head rises from the dark copper colored beer. Slightly sweet flavors of caramel, mild fruit, light toast and grains dominate very mild hop undertones and create a light/medium body and smooth finish. 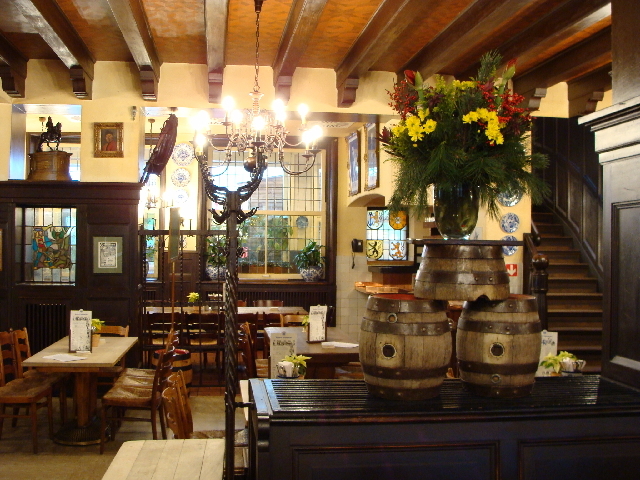 - This brewpub in a "suburb" of Düsseldorf houses a cozy dining room to the right; a middle bar area with traditional, dark wood; and a bright, refurbished room to the left with faux rock walls and models of brew kettles. - Altbier: Aroma leans toward malt with hints of cherries and banana. At 21-22 SRM, this brown Altbier comes in at the dark end of the style's color range and throws dark cream/beige foam with medium head retention. There's a substantial carbon dioxide prickle on the tongue and a note of hazelnuts and caramel in the aftertaste. - A smoky, neighborhood brewpub filled with locals enjoying their Altbier. Quaint trinkets and decor from the town adorn the walls. - Altbier: Light aromas of well-balanced, toasty malt and floral hops set the stage for a clean flavor profile that includes light/moderate noble hop bitterness; elegant toasted Munich malt; and a very mild, dark toffee finish. A smooth, refreshing, crisp Altbier with impressive malt/hop balance, light esters and a slightly dry finish. Dark copper in color with a thick band of ivory/cream colored foam. "Sticke" means "secret," and the term designates a higher gravity version of Altbier that was once produced just for brewers and pub owners. Darker, sweeter, maltier and more complex than regular Alts, Sticke also boasts enhanced lagering periods and hop intensities (even dry-hopping). Available for consumption at the Düsseldorf pub only on the third Tuesday in January and October, Uerige's Sticke also makes its way to several U.S. export markets year-round. Double Sticke, an extra powerful version from Uerige, continues to gain notoriety as well. Latzenbier, Schumacher Brewery's extra potent Altbier, sells at the pub on the third Thursday of March, September and November.